If you've been following my blog for a while, you know that I've done a lot of work, presenting and studying about how to help struggling readers. I love working with struggling readers. Even though I enjoy the challenge, I still feel the (sometimes overwhelming) "pressure" to get them where they need to be. Here are some of the things I do with my students to give them extra support. 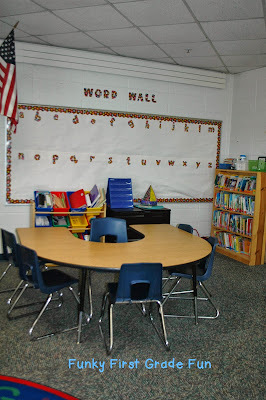 Each student visits my "horseshoe" table for reading practice with me at their instructional level 4 times per/week. Struggling students visit the horseshoe table 5 times each week. Each student visits 8 different centers throughout the week to reinforce skills and participate in independent practice activities. 5 of my stations are Daily 5ish. You can read about how I plan some of those centers here. Then I also have a few extra stations. My students visit 2 centers each day (only 4 days a week). On the 5th day, we do our spelling test (with super spelling slippers and individualized word work while I work with struggling readers one more time). We use the Dolch list for sight words. Each student in my classroom has a word ring to help them practice the specific sight words they each need to learn. My word rings have the first 5 "unknown" words that the student missed on the list. They practice reading their words to a parent volunteer each morning and to me later in the day. If they know the word automatically (3 seconds or less), they get a tally mark on the back of the card. When a word card has 10 tally marks on the back, it is replaced with a new unknown word from the list. By the end of the year, the goal is for all of the students to no longer have a word ring (because that would mean they know all of the required words). *I let my students pick fancy piece of cardstock for the front of their word ring (so they can easily pick their own out of our bin if I ask them to go get their word ring). 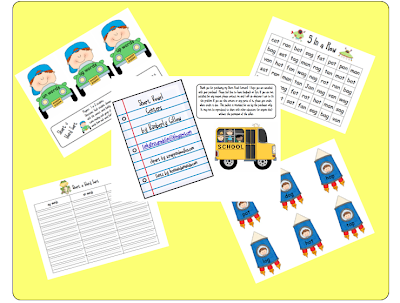 Each of the students who start the year with a reading level that is on grade level or below grade level get a personal reader folder in my classroom. The folders contain simple stories that I wrote myself. You can read more about my personal reader folders by clicking on the image below. During reading group time, the students with a personal reader folder highlight specific things in each story (a particular sight word, word family or vowel pattern). Then they practice reading the story to me and partner. After a few days of practicing a particular story with me, they read the stories we have already worked on to parent helpers (4 days a week). 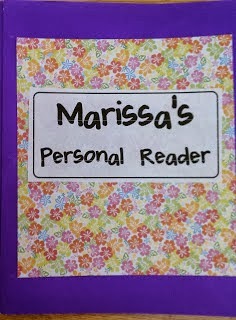 I have 3 sets of Personal Reader Folder stories available in my Tpt store. I use the Ganske Developmental Spelling Inventory (DSI) to determine which skill each child needs to work on for individualized word work. The Ganske DSI is a continuum that ranges from beginning consonants to long vowel patterns and other unique long vowel patterns. I prepare bins full of games/activities for each step on the Ganske continuum. Based on each students placement on the continuum, I am able to determine which skills he/she needs to work on. Then I tape a class list to each of the bins full of games/activities I prepared. On the class list on each bin, I highlight the names of the students who need to play those games. For example, if the Ganske indicates that a child needs to work on digraphs, then I will highlight his/her name on the digraph bin. That makes it easy for me, the students and parent volunteers to determine who should play the games in each bin. I do the Ganske at least 4 times a year, to document progress and update the individual work work bins. I use games/activities from several different sources. But, I have made many of the ones I use myself. Here are a few of my students favorites. 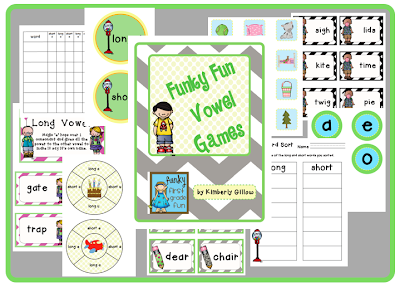 I'm working on a few new games for digraphs and blends that I'll be posting soon (and using in my individualized word work bins). My students who are below grade level have reading buddies who visit each day to listen to them read. My building is a K - 2 building, so we use 2nd graders as our reading buddies. The 2nd graders who are reading buddies are chosen by their teacher and come to my room every day after the morning announcements. It's a win-win situation for our little ones. My first graders love to read to a "big kid" and the 2nd graders feel the reward of being a leader in our school. Guess I better get busy working on my planning for the week! Happy Sunday! Thanks for all of the great info. What are the other students doing while you are working with the struggling readers? How do you keep the rest of the class occupied during instructional reading time?